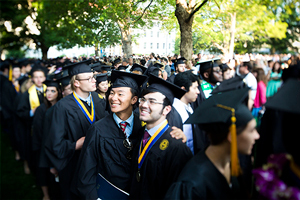 Emory University will celebrate its 171st commencement ceremony Monday, May 9. With approximately 15,000 in attendance, the graduation ceremony — rich with pageantry and tradition — offers a unique expression of university values, including academic commitment and integrity, citizenship, leadership, service, and exceptional teaching, research and mentoring. William Foege, MD, the renowned epidemiologist credited with devising the strategy to eradicate smallpox, will deliver the keynote address. This page represents a collection of stories from the Emory News Center about the event and the students in the Class of 2016. During their freshman orientation at Emory University, the members of the Class of 2016 assembled on the quad in the formation of their graduation year.